Posted July 28, 2014 by Julia Kidwell . Technology is increasing and providing us with newer, better and smarter devices, and with the increase of technology, there is also an increase in the internet traffic generated by our mobile devices. This causes a growing need for businesses to accommodate these mobile users on the web, and what some small businesses may not know is that their website is not providing mobile users with a positive online experience. As a mobile user, there is nothing more frustrating than finding what you are looking for online and not being able to view the content. A study by Latitude reported that in an international study, 61% of mobile users favored brands that gave them a good mobile experience. According to the Cisco System’s VNI Global Mobile Data Traffic Forecast Update, the amount of mobile traffic on the internet in 2013 was almost 18 times more than the entire global internet traffic (yea, I said global!) in the year 2000. This is a great example of how much mobile traffic has increased over the last decade, and will potentially continue to grow. 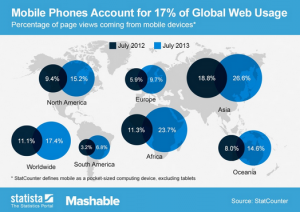 This infographic from Mashable shows how much smartphones contributed to online traffic in 2012 and increased in 2013 around the globe; increasing by 5.8% in North America alone from 2012 to 2013. You read that right! Google is fed up with unresponsive websites too. If your website is not built with responsive design, it might show up in the search engine giant’s results like the example below, alerting users that your website may not load on their device. This could cause a very large decrease in your click-through rate on Google results pages. Businesses with a responsive website not only give mobile internet users a better experience, they also build a better online relationship with them. Call us today at 303-703-8000 or contact us for more information about what we can do for your website.